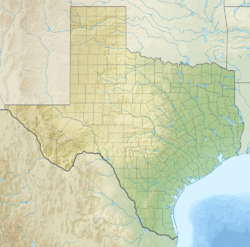 Guthrie is a small town in, and the county seat of, King County in the U.S. state of Texas. It lies at the junction of U.S. Routes 82 and 83, ninety-six miles east of Lubbock. It serves as the principal headquarters of the Four Sixes Ranch. and is the only community within its namesake Census Designated Place (CDP). As of the 2010 Census the population was 160. Guthrie is located at 33°37′14″N 100°19′22″W﻿ / ﻿33.62056°N 100.32278°W﻿ / 33.62056; -100.32278 (33.621341, -100.8322). Guthrie's history begins in 1883, when the Louisville Land and Cattle Company in Louisville, Kentucky purchased several hundred acres in what later became King County. Named after Louisville Land and Cattle stockholder W.H. Guthrie, the community's townsite was platted in 1891 by Andrew Chester Tackitt (Son of Rev. Pleasant Tackitt, who had built Guthrie's first residence. When King County was organized that same year, Louisville Land and Cattle proposed the platting of a company townsite, to be named Ashville, to serve as the county's seat. Tackitt strongly opposed this proposition and led a charge to bring the seat to Guthrie instead. Tackitt's hotly contested campaign ultimately proved successful, and he not only succeeded in making Guthrie the county seat but was also elected to serve as King County's first county judge. Late in 1891, the Guthrie post office opened to the public. The next year, Tackitt and a man by the name of Charlie Bradford brought in lumber from the neighboring community of Seymour and constructed Guthrie's first school; a small, one-room building. A larger school followed in 1895, though the lone teacher continued to depend upon schools in Seymour and Benjamin for curriculum. Proprietor John Gibson began to keep a stock of school books at his Guthrie general store in 1897, decreasing the school's dependence upon other districts. In 1904, Guthrie claimed 101 residents and though hurt by the effects of the Great Depression and the Dust Bowl, remained stable through to the mid-twentieth century, with the 1950 Census reporting the same number of 101 residents as 46 years before. In 1959, schools in nearby Dumont were consolidated with Guthrie's schools and by 1963 the population had more than doubled to 210. The mid to late 1960s brought an end to Guthrie's growth, however; the population had fallen to 125 by 1970. It increased to 140 in 1980 and 160 in 1990, a figure it maintained through to the 2010 Census. Being a company town, very few homes in Guthrie are privately owned; most residents live in housing provided by the 6666 (Four Sixes) or Pitchfork ranches, or the school district. Author Mitch Cullin graduated from Guthrie School in 1986, and while the setting of his early writings was often the town of Claude in Armstrong County, Cullin has admitted in interviews that his novels Whompyjawed and Branches are really based on Guthrie. Guthrie is also mentioned in passing in Jack Kerouac's On the Road as one of the places through which he drove. Guthrie is served by the Guthrie Common School District, which consistently ranks as a Recognized school district by the Texas Education Agency. According to the Köppen Climate Classification system, Guthrie has a semi-arid climate, abbreviated "BSk" on climate maps. Guthrie has a USDA hardiness zone of 7b, with minimum temperatures ranging from 5 to 10 °F. ^ "Guthrie on TSHA". Retrieved 28 November 2014. ^ "2010 Census: Population of Texas Cities". Retrieved 28 November 2014. ^ "The Austin Chronicle (Nov. 10, 2000)". Retrieved 28 November 2014. ^ "Climate Summary for Guthrie, Texas". Weatherbase. Retrieved 28 November 2014. ^ "USDA Plant Hardiness Zone Map". usda.gov. ^ "Guthrie, TX Monthly Weather Forecast". Weather Channel. Retrieved 11 May 2018. This page was last edited on 10 February 2019, at 17:45 (UTC).